Own the film that premiered at MUFON 2011 L.A. and started a buzz throughout the field! Now in stock and shipping! The entire FIVE DISC set is only $29.95 for a limited time! The Documentary, “IT COULD HAPPEN TOMORROW” is fantastic, but it’s the conversations that make this set incredible! Each one is a beautifully edited, three camera production. George Noory Talks with Cheryll Jones and Ron James about his own personal media journey. George Knapp and Ron James get really frank about the reality of disclosure. Linda Moulton Howe talks with John Burroughs about the Rendlesham Forest UFO. Richard Dolan Talks to Ron James about "After Disclosure" and the spiritual evolution of humanity. Richard Dolan talks to Stephen Bassett about government and disclosure. Richard Dolan talks to Danny Sheehan about religion and disclosure. Steve Bassett and Danny Sheehan have a heated debate about antagonizing the government. Steve Bassett and Roswell producer Paul Davids hotly debate the role of the media in the truth embargo. Peter Robbins and Gary Hesseltine debate theology and disclosure. Jen Stein and Paul Stonehill get to the bottom of the debate from a laymen’s perspectives. Frederik Uldall and A.J. Gevaerd talk candidly about international disclosure! Finally, Ron James talks frankly with Stan Romanek about his outrageous stories of contact! The main Documentary, "It Could Happen Tomorrow" covers the history of the truth emabargo, the media's role in the truth embargo, the church's role in disclosure and finally, what are the real social and spiritual implications of such a historic moment? There will come a day when Disclosure and its history are the subject of study. THIS SET will be referred to as the best source of information ever compiled in one place. 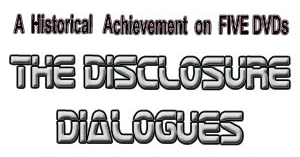 The Disclosure Dialogues are the definitive collection ever assembled on the state of disclosure. This is a five disc set that starts with an excellent 70 minute documentary, featuring contributions from virtually every relevant figure in the field today. Everybody goes to conferences and hears the lectures. But Imagine being in on the private conversations, the quiet dinners, the intellectual bantering of the greatest minds to ever ask these bigger questions. With over 12 hours of fascinating full length dialogues, you will go inside the field like ever before. The Disclosure Dialogues. A historical achievement you simply must own. 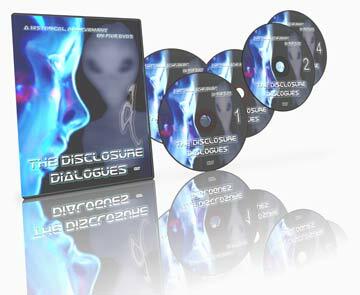 THE DISCLOSURE DIALOGUES COMES ON FIVE DVDS IN A DELUXE BOXED SET THAT YOU WILL BE PROUD TO OWN. CHOOSE FROM TWO OPTIONS AND MAXIMIZE YOUR DVD COLLECTION! ALL DVDS are playable worldwide. plus $4.95 worldwide shipping and handling. 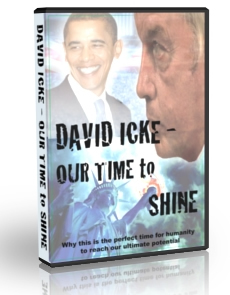 Brand New From David Icke! A new, fresh and positive spin on all the things we confront. This is truly, Our Time to Shine!